Handmaiden has had the misfortune to bump into two above-average juveniles this season and can open her account in the totepool Cashback Club At totesport.com Fillies' Novice Stakes at Chelmsford. The Invincible Spirit youngster had the unenviable task of taking on subsequent Group One winner Quorto on her debut, but did best of the rest in second. She went back to Newmarket nearly a month later and this time was beaten by another in Godolphin blue, Lover's Knot, who is a possible for the Rockfel later this week. The third that day, Roger Varian's Yourtimeisnow, won her next two and is also Rockfel-bound, so the form looks strong. John Gosden has given her plenty of time to get over those exertions and she can be expected to go one better. Owen Burrows' team has sprung into life at this late stage of the season and his Akhlaaq is of interest in the Irish Lotto At Totesport.com Handicap. A winner first time out in August 2016, he has only been seen on three other occasions, but showed he had plenty of ability on each of those outings. The long lay-off is not a worry, it has been well over a year, but Burrows has had a couple of winners of late brought back from similar gaps. The first-time hood can help him conserve his energy. Indian Pursuit is enjoying a purple patch for John Quinn and can win for the fourth time in five starts in the Double Delight Hat-Trick Heaven At totesport.com Handicap. He won over this course and distance last week and has a 6lb penalty, but 5lb of that has been offset by the booking of apprentice William Cox. 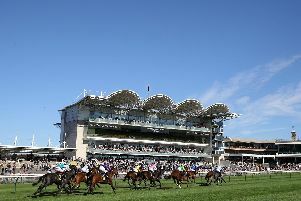 The Ayr Gold form gets an early test as Perfect Pasture runs in the Eddie And Violet Smith Conditions Stakes at Beverley. Mick Easterby's very capable eight-year-old showed he was as good as ever first time out this season when winning a Listed race at the Lincoln meeting. Given his preference for cut in the ground, the heatwave was all against him and he was not seen again until Chester in early August. He never went a yard there, proving once again he must have cut, and with plenty of it at Ayr he ran a blinder to finish sixth. This race could have been framed for him as long as he is over his Ayr run. Les Eyre's Detachment went close in the Leger Legends race before bolting up at Pontefract last week and should defy a penalty in the first division of the Season Finale Handicap. William Knight had a nice youngster win at Newbury on Friday and his Chinese Alphabet showed enough on debut to suggest he should be in the firing line in the first division of the one-mile maiden at Lingfield. He raced keenly at Salisbury but did well to still finish fifth of 10 behind Global Hero, who might prove to be pretty smart. In the second division, Ralph Beckett's Sam Cooke should take a great deal of beating having finished second on his introduction at Kempton. Over the jumps at Warwick, Nicky Henderson's Beat That should have little trouble in maintaining his good recent record over fences in Birdie's 2019 Wall & Desk Calendars Handicap Chase. BEVERLEY: 2.10 Power Rush, 2.45 Ramesses, 3.20 Keepup Kevin, 3.55 Perfect Pasture, 4.30 Detachment, 5.00 Prancing Oscar, 5.30 Charles Kingsley, 6.00 Ventura Crest. CHELMSFORD: 5.45 Dombra, 6.15 HANDMAIDEN (NAP), 6.45 Rux Ruxx, 7.15 Akhlaaq, 7.45 Habub, 8.15 Indian Pursuit, 8.45 Avocet. LINGFIELD: 1.30 Agar's Plough, 2.00 Chinese Alphabet, 2.35 Sam Cooke, 3.10 General Zoff, 3.45 Welsh Lord, 4.20 Ban Shoof, 4.50 Khafooq, 5.20 Staffa. WARWICK: 2.20 Laughing Louis, 2.55 Cap Du Nord, 3.30 Silk Run, 4.05 Beat That, 4.40 Dory, 5.10 Jonagold. Double: Handmaiden and Perfect Pasture.